The New York State Department of Motor Vehicles has opened a satelite office in Old Forge. The office is located in the Park Avenue Building, 183 Park Avenue, and is now open Monday-Friday 9 AM-noon and 1- 4:45 PM. For more information, please call the new DMV office at 315-369-3301. The mailing address is PO Box 1128, Old Forge, NY 13420, fax 315-369-9936. When the Old Forge office is closed, please contact the Herkimer County DMV at phone 315-867-1130. Enhanced Drivers Licenses will be done by appointment. If you are interested in scheduling this please call Sylvia M. Rowan at 315-867-1129. 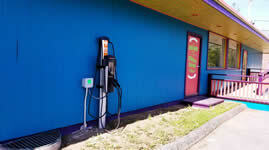 The charging station, located at the Front Door Diner at 3092 NY28, is sponsored by building owner Bob Card. Local medical services are available through the St. Elizabeth's Medical Group, located at the beginning of South Shore Road in Old Forge. This is NOT an urgent care center. At any time, before driving to the office or referring someone, please call 369-6619 to determine the availability of medical care. Call 369-6619 for further information and instructions. Runs Thursday through Saturday (July 1 through Sept. 2) from 10 am-4:30 pm. The Night Owl Shuttle runs Friday and Saturday nights from 6 to 10 pm. The Shuttle Bus provides free rides throughout the community, from Van Auken's Inne and the Thendara Railroad Station at the south end to Old Forge Camping Resort at the north end. There is also regular service from Thendara to McCauley Mountain. The shuttles are wheelchair accessible, and service the 14 designated stops every 20-25 minutes. Look for the Moose, Bear, Eagle and Owl logos marking the designated stopping points.